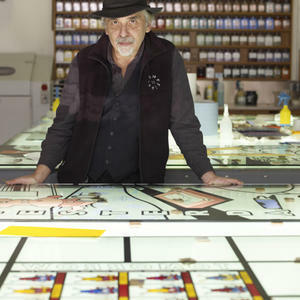 Art Spiegelman is a highly acclaimed comic artist, writer and editor based in New York. In 1992, he won the Pulitzer Prize for his masterful Holocaust narrative MAUS – which portrayed Jews as mice and Nazis as cats. Spiegelman has almost singlehandedly brought comic books out of the toy closet and onto the literature shelves. MAUS II continued the remarkable story of his parents’ survival of the Nazi regime and their lives later in America. His comics are best known for their shifting graphic styles, their formal complexity, and controversial content. As creative consultant for Topps Bubble Gum Co. from 1965-1987, Spiegelman created Wacky Packages, Garbage Pail Kids and other novelty items, and taught history and aesthetics of comics at the School for Visual Arts in New York from 1979-1986. In 2007 he was a Heyman Fellow of the Humanities at Columbia University where he taught a Masters of the Comics seminar. In 1980, Spiegelman founded RAW, the acclaimed avant-garde comics magazine, with his wife, Françoise Mouly. MAUS was originally serialised in the pages of RAW. Spiegelman and Mouly recently co-edited Little Lit, a series of three comics anthologies for children published by Harper Collins, and Big Fat Little Lit, collecting the three comics into one volume. Currently, the pair publish a series of early readers called Toon Books – picture books in comics format. Spiegelman’s work has been published in many periodicals, including the New Yorker, where he was a staff artist and writer from 1993-2003. A collection of his New Yorker work appears in Kisses from New York. In 2004, he completed a two-year cycle of broadsheet-sized color comics pages, In the Shadow of No Towers, first published in a number of European newspapers and magazines, including Die Zeit and the London Review of Books. A book version of these highly political works was published by Pantheon in the US, appeared on many national bestseller lists, and was selected by the New York Times Book Review as one of the 100 Notable Books of 2004. In 2005, Spiegelman was named one of Time magazine’s 100 Most Influential People and in 2006 he was named to the Art Director’s Club Hall of Fame. He was made a Chevalier de l’Ordre des Arts et des Lettres in France in 2005 and – the American equivalent – played himself on an episode of The Simpsons in 2008. In 2011, Art Spiegelman won the Grand Prix at the Angoulême International Comics Festival, marking only the third time an American has received the honor (the other two were Will Eisner and Robert Crumb). His latest book is CO-MIX: A Retrospective of Comics, Graphics, and Scraps. Art Spiegelman: What the %!&* Happened to Comics?